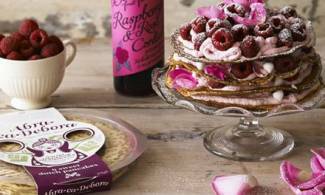 Lovely layers of pancakes, raspberries and meringues – all jazzed up by Belvoir’s yummy Raspberry & Rose Cordial. Heat the pancakes in the oven for 10 minutes, then leave them on a flat surface to cool down. In the meantime, whip the cream and mix in a dash of that lovely cordial. When the pancakes are cool, layer them up with the cream (using a patisserie pipe), raspberries and meringues in between. Yum! Top it all off with extra raspberries, icing sugar and a handful of rose petals.